As part of your evaluation, Dr. Coleman may recommend custom veneers to improve your smile. Veneers can be created in our on-site laboratory by our own dental ceramist. 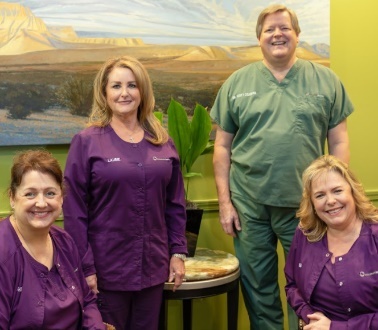 Our facility offers the best restoration and treatment for veneers because Dr. Coleman can address any questions and concerns in person with the ceramist. Plus our no-prep veneers do not damage your natural teeth and are completely removable if you ever decide to go back to your original smile. While most dental practices wait up to 4-6 weeks after they send their lab work to an outside laboratory, our custom veneers can be crafted within two business days, then fitted and improved on site. We want to ensure the best, longest-lasting restoration for you. Behrooz (Ali) Ghavidel, has worked as a ceramist with dental specialists and labs in Tehran and Houston for almost 30 years. Specializing in no-prep veneers, Behrooz meticulously crafts each patient’s veneers with his own hands from start to finish. He has perfected this skill and technique into an art form to give you a one-of-a-kind smile.